I could have gone so many different ways with this food holiday. Post holidays, I've seen Walker shortbread cookies on sale. So I could have bought those and talked about it. But even on sale it was a bit too pricey for my taste. And shortbread cookies are a year-round deal. Like November. 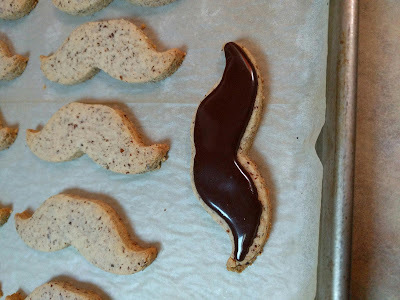 For Movember. That's when I baked these cuties. I've been on a cookie kick, and doing more with decorated cookies. These are gluten free, made with almond meal. Not the blanched like the recipe had called for, but regular ol' almond meal. I like the built in speckles. And I gotta say, they were pretty good! I've been trying to find the exact recipe I used, but it's stuck in one of my many cookbooks I have out. What I do know is this recipe from King Arthur is one of the recipes I tagged to try out. And you don't just have to use almond flour - cashew or hazelnut would be good options.